Haven't posted much since June Faire because, for the most part, I've been busy with weaving stuff, there's no events that we'll be going to for a while and it's been HOT. 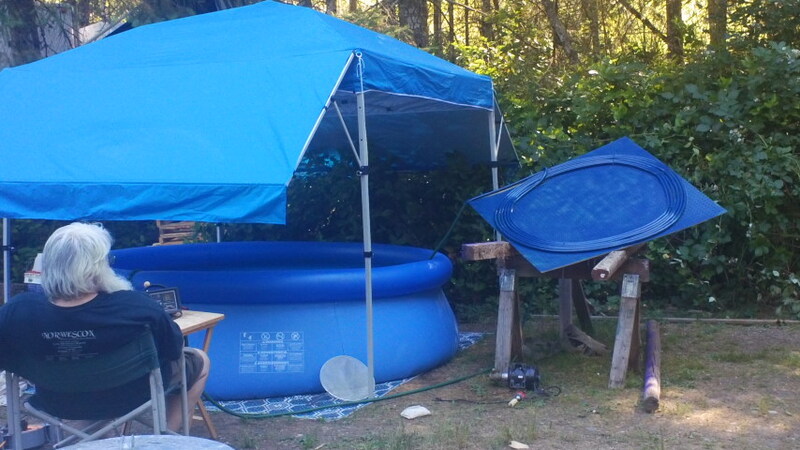 We have been having fun, however, with a small easy-to-set-up pool to keep cool with. Well, just a little too cool. We hooked up a solar heater to it with a water pump out of an RV and 200 feet of hose painted black. Water exiting the hose is 78 degrees with is much better than the temperature that the pool started out with which was 70 degrees. It is slowly rising. At lease we don't have a heart attack anymore when getting into it. We took the pop up that I made the tent out of and put it over the pool. You see the solar heater here as as a single hose painted blue. We have since added hose (for a total of 200 feet) and painted it black.